Do you know what’s so special about the reverse chronological resume format? It proves that some good things never change. ...the reverse chronological resume layout. The reverse chronological resume is like the HR industry’s classic Bialetti Moka Express coffee pot: it’s been used since time immemorial and yet lost none of its charm. In short, because it's very usable, will survive trial by fire and make recruiters want to talk to you. If you’re thinking “oh, but it’s so common, unimaginative, and looks like all the other resumes,” you might actually be right. But only because you don’t know what to do. Yet. Time to learn how to dress up your reverse chronological resume so that it stands out from the crowd. Do it right, and you will land that dream job! A handy checklist for a reverse chronological resume template. A reverse chronological resume example better than 9 out of 10 other resumes. How to write a chronological resume that will land you more interviews. Tips and examples on how to put skills and achievements on a reverse chronological resume. How to describe your experience on a resume in reverse chronological order. Here's a sample resume made using our resume builder. 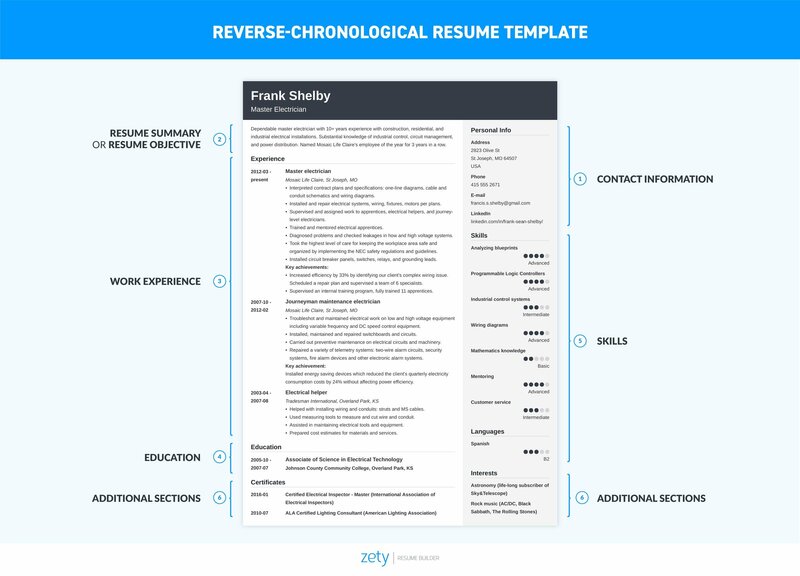 Want to save time and have your chronological resume ready in 5 minutes? Try our resume builder. It’s fast and easy to use. Plus, you'll get tips and right vs. wrong examples while writing your resume. 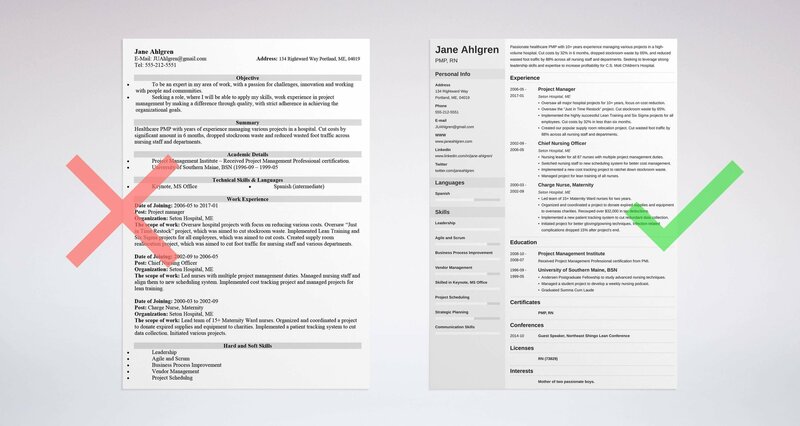 See 20+ chronological resume templates and create your resume here. Sample chronological resume made with our builder. See 20+ chronological resume templates and create your resume here! What Is a Chronological Resume Format? Why Is It a Good Choice? A reverse chronological resume highlights your work history. You list your most recent or current position first. Then you work your way back in time to include previous jobs in reverse chronological order - hence, the name of this resume format. It’s the most common resume format and it’s arguably the best resume layout for most candidates. Because it saves the recruiters’ time. And their time is precious. The recruiters and hiring managers want to know if you’ll perform well in your new job. They verify this by looking at your career journey: the positions you held, the companies you worked for, and duties you performed. The purpose of a reverse chronological resume is to serve all that information on a silver platter. ProTip: Nowadays, many employers use Applicant Tracking Software (ATS) for scanning job applications. The ATS extracts key information about your career and looks for resume keywords in your resume. The ATS has been designed, primarily, to read reverse chronological resumes. So if you submit a resume in this format, you can be sure that the ATS won’t choke on it. When is a reverse chronological resume advantageous? Have a look at the differences between three resume formats: combination, functional, and reverse chronological. When is a chronological resume not advantageous? As you can see, the only potential shortcoming of the reverse chronological resume layout is that it seems basic and unoriginal. Read on and we’ll show you how to make easy tweaks to your basic chronological resume so that you have the best resume format out there. The whole point of resume formatting is to organize the content you want to include for the recruiter’s convenience. You need to divide your resume into specific sections. Reverse chronological resume sample made with our builder—See more templates and create your resume here. That’s pretty obvious, right? You want your resume to make the recruiters call you for an interview, but they need to know how to reach you. ProTip: In your contact information section, you should include a link to your LinkedIn profile. Don’t have one yet? Well - get one! Almost 9 out of 10 recruiters expect you to be on LinkedIn. This section is an introduction to your resume. Its purpose is to present you as the perfect candidate for the job. A resume summary highlights your career progress and achievements. A resume objective, in turn, shows what skills you’ve mastered and how you’d fit in. In this section, enter a list of your former positions in reverse chronological order. Your current or most recent job is at the top of the list, followed by previous positions. Usually, all you have to do in this section is to file your highest degree of education. Enter the name and location of your school, your major, and the graduation date. In this section, list your skills relevant to the job opening: the languages you know (because these are always worth mentioning), IT skills, job-specific skills, and, last but not least, your transferable skills a.k.a. “soft” skills. All of the above sections are must-haves. But those don’t add up to a perfect chronological resume - just a decent one. Additional sections can turn a decent chronological resume into a perfect one. And there you have it - a complete reverse chronological resume outline. ProTip: Resume file format matters! It’s usually a good idea to have your reverse chronological resume in PDF - this way you make sure that your resume layout stays intact. But remember to double check the job description and make sure the employer accepts PDFs. In case they don’t - send a Word resume. The recruiters are very busy people. They have to review hundreds of resumes every day. Do you know how long, on average, they take to scan one? During those 6 seconds, they’re going to look only at the top third of your resume. That’s why you have to put the most relevant information up there. Only then will you catch the recruiters’ attention. If you’re an entry-level candidate, a career changer, or if you’re writing a student chronological resume, use the resume objective. Tell about your skills that will make you perform well. Focus on the benefit your employer will gain by hiring you. 3.2. Add measurable achievements to the descriptions of your past jobs. Let’s say you’re applying for a social media manager position. In your current job, you designed a Facebook marketing strategy to help improve online sales of one of your clients. Here’s how to show it off in your work experience section. Key achievement: implemented a new Facebook marketing strategy to help increase the fan base from 3,000 to 12,000 in 4 months which boosted the monthly online sales by 49%. To maximize your chances of landing an interview, you need a separate resume for each job application. Because the recruiters don’t have time to read your whole resume. Instead, they will look for very specific keywords [LINK: how to put keywords on a resume] that show you’re the right candidate. Don’t stress out, it’s really easy to find them! If you read a job description and see tasks that you’ve done previously in your career, you have to mention them on your resume. We’ve got some good news for you! More often than not, listing your education on a reverse chronological resume is easy. Still, there are some standard rules on how to do it. And you have to follow them. The common advice is to mention only your highest degree of education. The type of your degree. The name and location of your school. Your honors, awards, and other relevant achievements. Alright, but what should you do if you’ve graduated from a prestigious college and want to show it off, or you’re writing a student chronological resume and have little relevant work experience? Put your education section above your work experience. Describe your coursework and your academic interests and achievements. At the end of the day, it’s your skills that make you a great professional, right? So make your reverse chronological resume emphasize and showcase your skillset. Job-specific skills - those that are related only to your field. Transferable skills or “soft skills” - your personal attributes and abilities that are useful across various industries. IT skills - proficiency in operating computer software used in your industry. For most corporate positions these are an absolute must-have. Then, read the job description carefully. Look for skills-related keywords such as “MS Office proficiency”, “written communication”, “multi-tasking” or “timeliness” and highlight them. Remember when we mentioned tailoring? Here it comes again! You need to match your skills from the worksheet to those your future employer expects. Most job seekers lie on their resumes. So show the recruiters that, unlike others, you mean business. On your reverse chronological resume, put additional sections that validate your value as a candidate. If you’ve got certifications relevant to your field - enter them on your resume. If you’ve published articles in industry journals, tell the recruiters about it and, if possible, add links to your pieces. Participated in professional conferences? List them on your chronological resume. 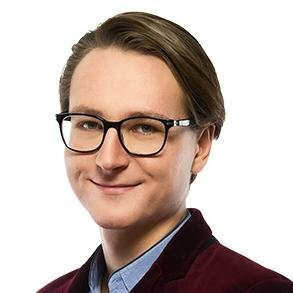 Run an industry blog? Perfect! Put the URL on your resume. For instance, you can add a hobbies and interest section. Your hobbies show that you’re a good cultural fit for the company. And, nowadays, it’s becoming more and more important for the employers. ProTip: Once you’ve sent out your resume, don’t forget to follow up! It shows that you’re genuinely interested in the job offer and not just applying to anything you see. And some employers won’t even consider your application if you fail to follow it up with an email or a phone call. Tailor your resume to the job description. Make sure to use keywords from the job ad on your resume. If you have little or no work experience, put your education section above your work experience. Quantify your achievements whenever possible and use action words. Show that you’ve got another string to your bow by adding an additional section: certifications, publications, industry awards, or volunteer experience. Would you like to learn more about how to make your reverse chronological resume template fully advantageous? Not sure how to list your professional achievements in reverse chronological order? Give us a shout in the comments and we’ll answer your questions!